The Bozo Sidepull is a replica of the headgear World Champion barrel racer Kristie Peterson used on Bozo. 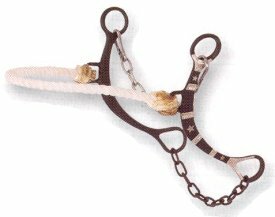 The shape of the shank and length of the nosepiece combine to create a sidepull hackamore that allows your horse to be comfortable enough to really run in, yet gives you enough control to rate and regulate the run. It helps correct a horse that is over bending, and is more for the finished horse than for training.